3.Root Control attachment UR1 in order to correct tipping teeth UR1. 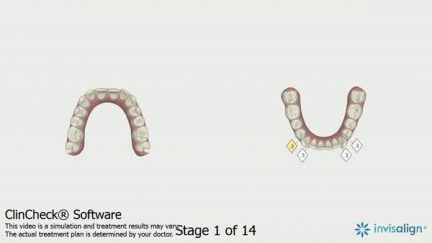 4.Clincheck Esthetic Start strategy : Aligners L1 to L7 we achive partial alignment of lower anterior teeth in order to motivate the patient with short term esthetic results before starting lower arch sequential lower molar-premolar-canine and finally lower incisor distalisation. 5.Upper arch Crowding and lateral Posterior Crossbite( left side )was resolved with Expansion. No uper IPR was requiered. 6.Anterior Cross Bite was resolved with a combination of : Lower arch distalisation ( principal space achiever) + IPR 0.5mm lower anterior ( incisors and canines) + Upper incisor proclination. 7.High Patient Compliance is required. 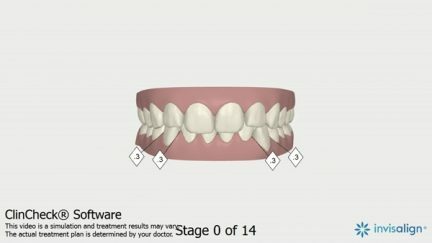 Full day 22 hours aligner+class III elastics. 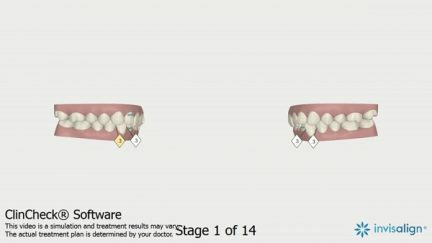 8.Treatment aligner change every 14 days. 9.Refinement aligner change every 7 days.